Coastal cutthroat trout can live to be over 12 years old. Coastal cutthroat trout occur as sea-run or freshwater-resident forms in streams and lakes along the coastal range from lower Southeast Alaska to Prince William Sound and are the most common trout species in the region. The freshwater-resident form lives in a wide variety of habitats, from small headwater tributaries and bog ponds to large lakes and rivers. Sea-run cutthroat trout are usually found in river or stream systems with accessible lakes, mostly south of Fredrick Sound. In some watersheds, like the Taku River, the two forms are found together. The extent of breeding between the two forms is unknown, and the reason that some fish migrate to sea while others stay in fresh water remains an interesting question. Juveniles are 1–6 inches long and silver or yellowish to olive in color, with about 10 oval parr marks overlain with small black spots. Some juveniles will have a faint red or pink coloration along the lateral line and on the gill covers. The characteristic red or yellow slashes under the jaw begin to develop when a juvenile reaches approximately 3–5 inches in length. Adult coloration varies widely with habitat and life history: freshwater-resident fish living in small ponds or streams are typically 6–16 inches long, golden yellow with profuse black spotting on the body, head, and fins, and have vivid red slash marks under each jaw bone (hence the name cutthroat). Coastal cutthroat trout living in large landlocked lakes can exceed 24 inches in length, are uniformly silver with black spots, rosy gill covers, and faint slash marks under the jaw. Sea-run cutthroat trout are smaller, seldom more than 18 inches long. They are bluish-silver with dark or olive backs and less conspicuous black spotting; the characteristic slashes are faint yellow. With prolonged residence in fresh water and progression toward spawning condition, sea-run coastal cutthroat trout will darken up and closely resemble freshwater-resident pond- and stream-type fish. Lack of distinct slash marks in sea-run and lake-resident forms has led anglers to confuse these fish with rainbow trout. Cutthroat trout can most often be positively distinguished from rainbow trout (though with difficulty) by the presence of minute teeth between the gills behind the base of the tongue. The fact that cutthroat trout and rainbow trout often occupy the same habitats leads to their occasional hybridization. This hybridization can, make identifying cutthroat trout confusing, as hybrid fish are intermediate in appearance. 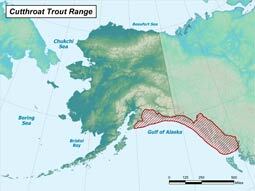 Coastal cutthroat trout grow quite slowly, often taking 12 or more years to reach trophy size (3 pounds). Maturity is reached at age 3–7, with males typically maturing earlier than females. Spawning occurs from April to early June and typically takes place over gravel beds in small isolated headwater streams, although they have been observed spawning in deeper rivers and in gravely upwelling areas of lakes. The selection of these small isolated streams likely results in less interaction with the more aggressive offspring of steelhead trout and coho salmon. Fecundity (number of eggs per female) varies with size and locality, but is typically less than 1000 eggs per female. Once the eggs are deposited and fertilized, they remain in the gravel for 6–7 weeks before hatching. Newly-hatched cutthroat trout remain in the gravel living on the contents of their yolk sac for an additional 1–2 weeks prior to emerging as free-swimming juveniles. Once emerged from the gravel, juvenile cutthroat trout will disperse to more ideal rearing habitats such as ponds, lakes, and backwater areas. Unlike Pacific salmon, cutthroat trout are capable of spawning multiple times during their lives, but they rarely survive to spawn 3 or more times. Depending on food availability, adults may skip a year or two between spawning events. Coastal cutthroat trout are carnivorous, feeding opportunistically on a variety of prey. Prey species and feeding techniques vary greatly depending on age, locality and season. Sea-run cutthroat feed on various insects and young salmon during out-migration. While at sea, they stay near shore feeding on amphipods and young salmon prior to returning to fresh water in the fall. During the winter, coastal cutthroat trout feed on sticklebacks, gastropods and salmon eggs in addition to insects and young salmon. In lake-resident forms of the coastal cutthroat trout, juveniles typically employ a sit-and-wait feeding strategy. These fish will find shelter such as lily pads or logs and wait for passing prey such as insects or small fish. Once the lake-resident forms reach a larger size (14 inches or more) they often take on a more active, cruising strategy and will chase down small fish along drop-offs and vegetation lines. Lake residents usually grow to the largest size among the various forms of this species in Alaska. 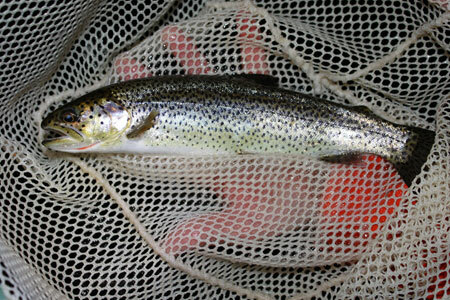 Sea-run cutthroat trout rear for 3–4 years in fresh water prior to their first seaward migration beginning in April. These first-time out-migrants are generally about 8 inches long. Time at sea varies from a few days to over 100 days before they return to their home stream. During their migration, they follow the shoreline, rarely crossing open bodies of water and seldom straying further than 50 miles from their home stream. In the late summer and fall they return to their home stream where they feed and mature during the winter months. Homing appears to be very precise. Cutthroat trout can return to spawn in the same tributary stream where they emerged and reared years before. Survival through the winter and first spawning season is about 40 percent, decreasing rapidly after the first spawning event. Less than 1 percent of the upstream migrants in a given year will survive to their third spawning migration. The fact that only about 60 percent of the migrants are sexually mature indicates the presence of feeding and over-wintering migrations in addition to spawning migrations. The coastal cutthroat trout ranges from northern California to Southcentral Alaska and makes use of a great variety of habitats within that range. Freshwater habitats range from the smallest headwater stream (often less 3 feet wide) to large deep lakes. Saltwater habitats range from brackish estuaries to fully marine shoreline environments. Over-wintering migrants, as well as lake residents, often select lakes and ponds to feed and wait out the winter, while stream-type residents frequently spend the entire year within relatively-small sections of a given stream. While in fresh water these fish prefer deeper pool habitat and cover, such as that formed by woody debris and undercut banks. Cold, clear, gravely headwater streams are selected for spawning, but typically vacated rather quickly in favor of larger water bodies with more cover and relatively-abundant food resources. For sea-run coastal cutthroat trout, time spent in salt water is typically just a few months but can extend for over a year in some cases. While in the marine environment, cutthroat trout prefer estuary and near-shore environments for feeding and cover. Throughout its range the coastal cutthroat trout is experiencing population declines, though the threats, and therefore the declines, are more sever in the southern portion of its range. Due to lack of widespread, long-term stock assessment throughout Alaska, it is difficult to assess population status and trends. In the Alaskan sea-run populations where long-term trend information is available, the population trends are declining, though for some monitored lake-resident populations, the status appears to be stable. The lack of long-term information on population trends makes it difficult to determine the true status of the species within Alaska, however with increasing harvest rates and urbanization and its associated environmental impacts, we can expect that these populations will show signs of downward trending. Many threats to the stability of coastal cutthroat trout populations exist including the recent loosening of federal subsistence fishery regulations, and habitat degradation due to mining, road construction, hydroelectric projects, oil spills, timber harvests, urbanization, and improper handling by sport fishermen.